In the future, getting internet connection might be as simple as flipping on your bedroom light switch! Yes… It would be that simple in the coming years. 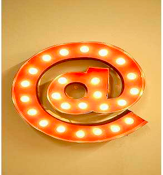 In fact, a group of researchers from Germany are claiming that they are able to encode wireless broadband signal into the lights coming from lamps. We are familiar with Ethernet connections and various types of wireless modes to connect home and office computers with Internet. Although we are more comfortable with wireless as a medium of communication but a large percentage of data centers and corporate offices use wired data connections. It’s a huge burden to maintain these types of setup due to its hunger for energy and space. Wireless medium made our life easier by removing cables from our surroundings. But it has bandwidth limitation and it’s unclear whether we will be able to accommodate more in the already-crowded radio spectrum. However, backbone communication system is now-a-days dominated by fiber optics. Yet we don’t use that much optical fiber connection in our day to day use. For fiber optic communication we use invisible frequency bandwidth. Whereas visible frequency has the bandwidth which is still not used for communication: a great possibility lies here. The advantage of using visible light is, it’s already there and you can’t live without it! We use fluorescents and incandescent bulbs for everyday use and it has other usage than lighting. It would have been great to use light for multiple purpose, especially to connect to the internet. Scientists and Researchers are continuously working on the field of communication to find easier, faster, reliable and environment friendly solution for communication. Very recently a team of scientists and engineers at Fraunhofer Institute for Telecommunications, Heinrich-Hertz-Institute, Germany has set a new record in the race to send data across light beams. Dr. Jelena Vu i and her team sent data from a server to an LED ceiling light that delivered three high-definition video streams to receivers attached to laptops. They were able to download at a rate of 100Mbps and reached up to 230Mbps, setting the speed record. Dr. Vu i claimed that rate could be doubled again by using more sophisticated modulation techniques. They claimed that using light instead of radio frequencies could help to download information at a faster rate than is currently available. If we dig deep down into the technical details of the technology it’s pretty simple to understand but challenging to achieve. It would require using LEDs rather than conventional bulbs and then encode information by flickering at a high rate- so fast that it is invisible to human eye. An optical sensor, more likely in the form of optical modem would be used to pick tiny changes in the light intensity. Upon decoding it will start downloading information from the internet. Using light source for communication could add extra security to the network than the current security level as light would not be able to pass through the walls unlike wireless signals which can be hacked into by any stranger sitting on the street. LED light bulbs are becoming available in supermarkets and soon would become the main source of light for everyday use. Once IEEE and other standard setting organization accept this new mode of communication, we may hope that within three to five years we will start seeing this kind of products in the market. Sending data using lights have been going on for few decades but to extract information directly from the light beam is totally new. It needs more study to make it usable at consumer level. 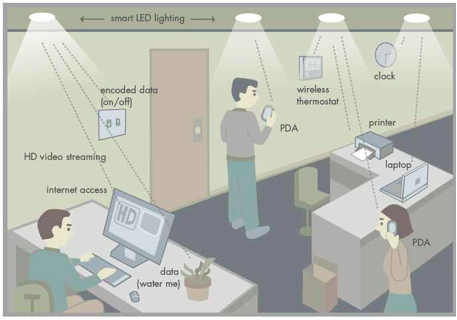 It’s in the near future when everyone will be enlightened by the wonder of Li-Fi ! Who knows…?